Three design/build firms describe how they crafted stunning custom homes on lots with steep slopes. 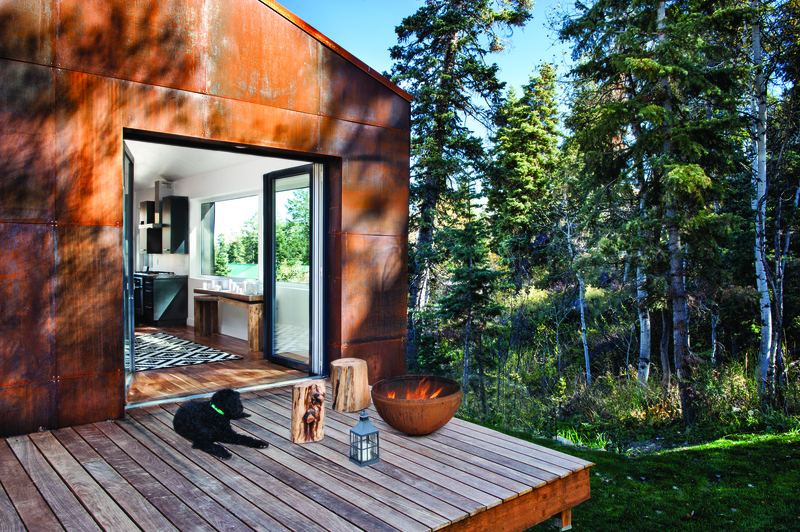 Constructed on a lot previously deemed unbuildable, this Park City, Utah, home features an exterior that is a hot-rolled steel rainscreen system developed by Park City Design + Build. “It weathers naturally; you don’t have to do anything to it,” says architect/builder/homeowner Chris Price (photo by Douglas Burke). Capturing million-dollar views is the goal with many one-of-a-kind custom homes. Often this entails building on a steep slope or, literally, the edge of a cliff. The site preparation required—not to mention the preliminary design and engineering—can be onerous. 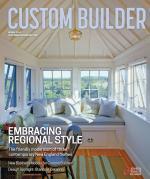 In this article, three design/build firms tell Custom Builder how they overcame the challenges of a daunting site. Lots in Summit Park, a neighborhood in Park City, Utah, tend to be very steep and very challenging, but that didn’t stop architect/builder Chris Price from designing and building his personal residence there. Price, a project manager and designer for Park City Design + Build, purchased a 70-by-120-foot rectangular lot in Summit Park that was unbuildable, according to county records. “There were some things wrong with the deed, and it took a couple of months to clear that up,” Price says. With slopes as steep as 45 degrees, the property was extremely intimidating, “but it worked out for me because I’m young and I have a ton of energy and was super-motivated to build my own house,” he says. Excavators made a 30-foot cut into the hillside, then bermed up into the hill, which helps mitigate temperature swings. Price built a retaining wall to hold back a large amount of loose soil that a neighbor had pushed onto his lot years ago. The 27-year-old LEED-certified professional was also keen on applying Passive House principles. He worked with an energy modeler who helped him design and build the home based on the program’s rigorous standards. The framing and ventilation became critical elements. The southeast-facing home, dubbed Summit Haus, nestles into the slope and takes full advantage of the views, which range from short and heavily wooded to a long corridor toward the Uinta Mountains. A private deck off the master bedroom is the perfect place for architect/builder/homeowner Chris Price to relax after a grueling workday. The bedroom is 13 feet by 14 ½ inches. The master bath is 10-foot-3 by 6-foot-2 and has a steam shower (photo by Douglas Burke). The 2,300-square-foot home has 2x4 walls on the inside and vertical Trus Joists (TJIs) every 24 inches on center on the outside. This assembly, which Price calls a modified Larsen truss wall, is 16 inches thick and insulated on the outside. The wall cavities are filled with copious amounts of cellulose insulation. There is also 12 inches of insulation underneath the radiant slab and 8 inches around the foundation. The metal roof was framed with 14-inch TJIs, topped by another 6 inches of insulation. R-values are 70 in the walls and 100 in the roof. Triple-pane, tilt-and-turn Zola Thermo uPVC windows, manufactured in Europe, offer performance that is “superior to any North American brand we have seen thus far,” Price says. Radiant heat on the first floor heats the entire house, and a heat recovery ventilator draws in fresh air and expels stale air. There is also a European wood-burning RAIS stove with external combustion. The heating bill for Summit Haus is only about $30 per month, compared with $200 to $300 a month for neighboring homes. Price worked 80-hour weeks during design and construction. He tackled a substantial part of the labor, including framing, plumbing, electrical, and trimwork while attending the University of Utah for a master’s degree in architecture and working full time at Park City Design + Build. 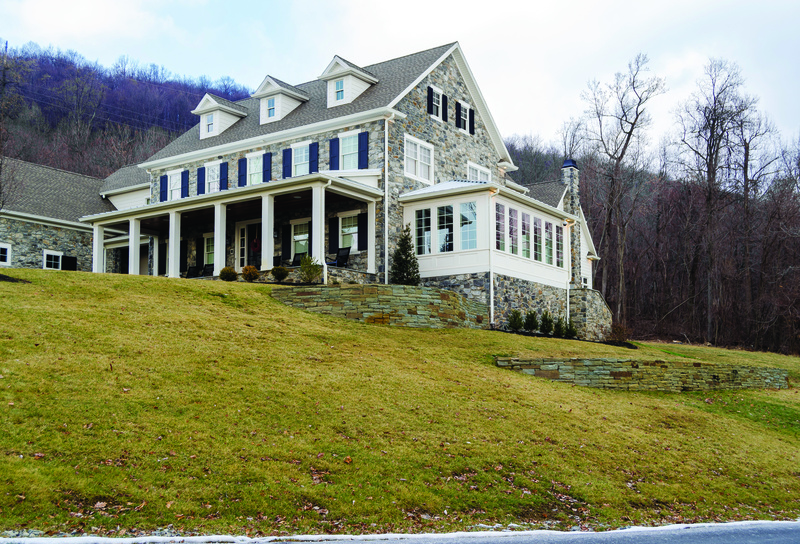 A couple in their mid-30s with four children under the age of 10 approached Farinelli Construction of Mechanicsburg, Pa., about building them a home on a heavily wooded hillside site. Living spaces accommodate a family of six, with a large kitchen island and a pantry with a sliding barn door (photo by Andy Warren). Classic farmhouse style is expressed in the deep, covered front porch where the family can enjoy sunsets and views (photo by Andy Warren). Town regulations prohibited building on the steepest parts of the 3-acre lot. “The further you got up the hill, the more problematic it was to get a driveway that wasn’t on a 12 to 14 percent grade and position the garage so it wasn’t visible from the street,” Farinelli says. A substantial amount of de-watering was necessary, partly because of underground springs on the property. “It didn’t help that it was a rainy time of year and we got hit by [Hurricane Sandy] in the middle of the process,” he says. Farinelli’s crew dug a massive, U-shaped infiltration trench behind the retaining wall located on the highest point of the slope. “We also used swales to divert water from the foundation,” he says. The builder saved as many trees as possible to give the clients privacy, and used stone retaining walls to craft a pool area in the back of the house. The garage is tucked around the side to mask it from view. To keep the driveway at a maximum 10 percent grade, it was designed with several switchbacks, like driving up a mountain road. Farinelli, his project manager, and three on-staff interior designers collaborated on the design, turning the house on the site in order to maximize the number of windows with a view. Instead of making the front door parallel to the road, they made it perpendicular, exposing the right side of the house. Farinelli’s cabinet shop crafted built-ins, nooks, and closets for every room that are customized to the clients’ daily activities. The flooring is wide-plank distressed walnut. 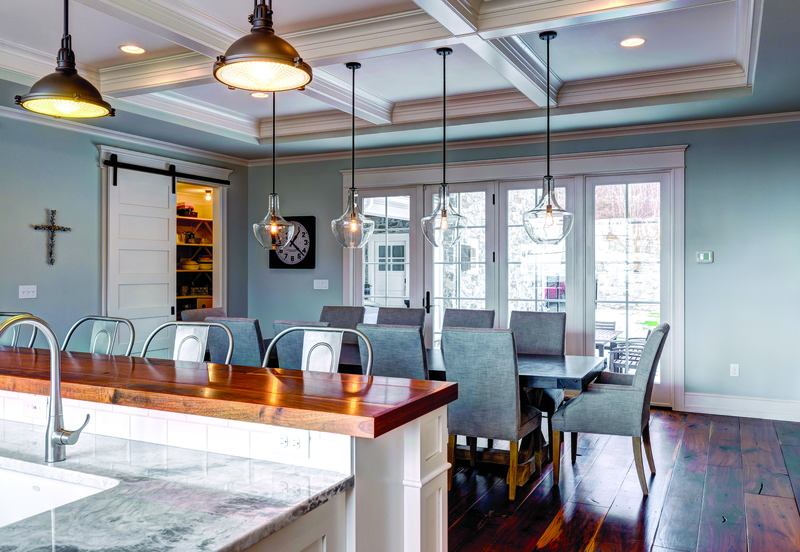 Shaker style dominates rather than raised panels in the cabinetry, trim, casings, baseboards and crown molding. The home features natural products such as wood and stone and even a reclaimed brick floor in the laundry room/pet-care area. In addition to a children’s recreation room on the second floor, there is a first-floor playroom that can be converted into a guest suite when the children no longer need it. The floor plan also includes a “command center,” a 300-square-foot room for various activities including bill-paying, arts and crafts, and homework. The command center is a few steps away from the kitchen and playroom. This home in Sequim, Wash., has spectacular views of the Strait of Juan de Fuca, Mount Baker, and the Dungeness Valley. On a clear day, the homeowners can see all the way to Whistler, B.C. 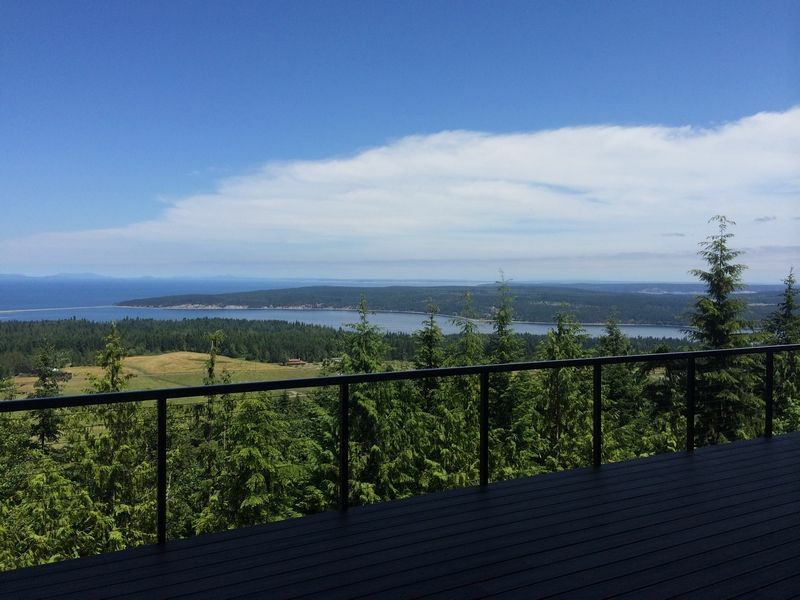 A home in Sequim, Wash., with breathtaking views of the Strait of Juan de Fuca, Mount Baker, territorial views of the Dungeness Valley and (on a clear day) Whistler, B.C., took 16 months to build due to extensive site work. The clients, a semi-retired couple, were looking for a durable, highly energy-efficient home with a modern design. Estes designed a 4,755-square-foot home to fit on the buildable portion of the site. The design was the result of a close collaboration between Estes and the clients. Many natural wood components were used to create a rustic, Northwest feel on the inside of the home, including exposed glulam beams, tongue-and-groove ceiling treatments, wood door and window trim, and open glulam stairs. There are also many modern features such as flush-panel laminate cabinets, open-cable railing systems, solid-surface tub decks, and an elevator. 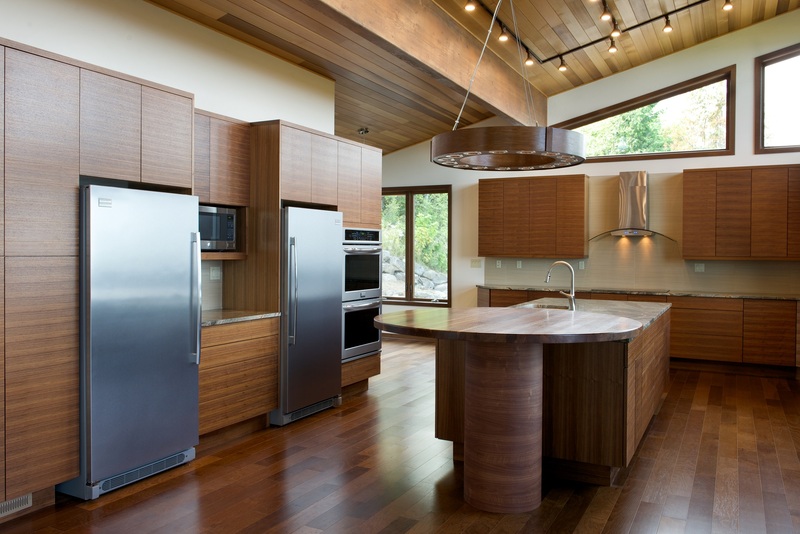 In the kitchen, trapezoidal clerestory windows and flush-panel laminate cabinets are distinctly modern looking, while the tongue-and-groove ceiling treatment lends Pacific Northwest flair. A single-pitch, shed-type, standing-seam metal roof and a deck supported by powder-coated steel knee braces give the home a modern look. Meanwhile, cultured-stone accents and tongue-and-groove cedar soffits tie the house back to its Pacific Northwest location. “The color palette makes it look right at home on the site,” Gross says. The three-level home includes a first-floor home office for him and a third-floor office for her. There is also a home theater; a home gym; and a woodworking shop. The main entrance is on the third floor as well as the living room, dining room, guest suite, and a kitchen with a coffee bar and walk-in pantry. 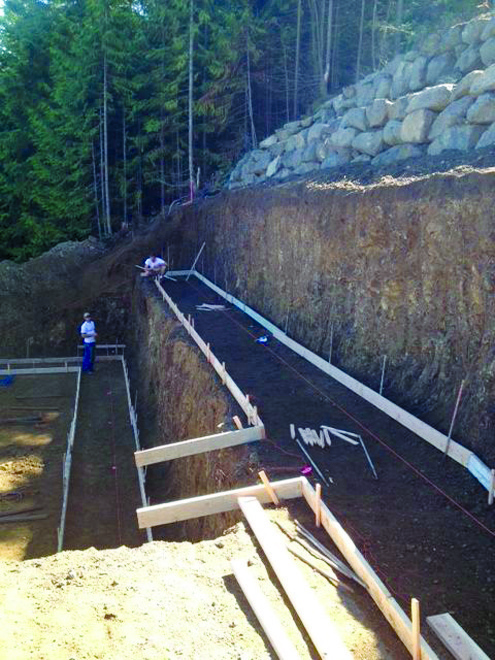 The Estes Builders crew installs footings for the foundation of a home on an extremely steep site in Sequim, Wash. This home in Sequim, Wash.,was built on a site with slopes that are as steep as 45 degrees in some places. Limited access made staging and installation of materials difficult, and special attention had to be given to approaches to the home for both vehicles and people. The slope also created additional challenges for trades working high above the ground. Gross estimates that it took three to four months just to clear trees from the site and complete the terracing and some of the retaining walls. “The dirt work was a little tricky because unless you have X-ray vision, you never know what you’re going to bump into,” he says. Comments on: "Triumph Over Tough Sites"